Kenny Rae Black was the first baby to die of Ogden Syndrome over 30 years ago. This year, AAAS member Gholson Lyon used VAAST to find the specific genetic mutation which caused the deaths of two of Halena Black's sons and three grandsons. The tight-knit community of Ogden, Utah, is normally a perfect place for baby boys to thrive. When Halena Black's first son, Kenny Rae, was born in 1979, she didn't think anything was wrong with him. He had strangely wrinkled skin, large eyes, and stiff movements, but since he was Black's firstborn, she didn't think there was a problem. After he failed to put on weight, she brought him to the doctors. They found a range of problems with the infant. But Black was sure he would pull through with only minor defects, thinking he would be dwarfed. 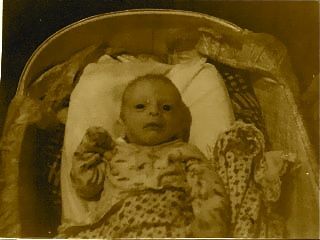 But Kenny Rae passed away in 1980, just before his first birthday. "I just couldn't think that the end result was that he wasn't going to be around," Black recalls. Black started to have more children, including two healthy baby girls. Her next boy, Hyrum, was born in 1987 and looked just like his older brother Kenny Rae. He had the same stiff movements and familiar face and never took naps. Black thought they looked alike because, after all, they were brothers. It didn't occur to her that they could share an underlying disease. "We hadn't experienced a healthy boy," recounted Black. "We didn't know that this was not how boys were supposed to look. And even when I had my second boy, we thought that the boys were just smaller and he looked like his brother." Hyrum also passed away before he celebrated a birthday. Black went on to raise five daughters and a healthy son. The tragedy faded into memory. When her daughters started to have baby boys of their own, boys that looked and moved like their deceased uncles, she then suspected there might be a bigger issue. Her family's doctor promised to get to the bottom of it. Thirty years after the death of Kenny Rae, AAAS member Gholson Lyon, M.D., Ph.D., and a team of researchers found the cause of Halena's tragedy. Kenny Rae and his brother Hyrum had Ogden Syndrome, a disease which Lyon has tentatively named after the Blacks' Utah town. It is caused by a single genetic mutation to the NAA10 gene. This mutation swaps one amino acid for another, a Serine amino acid for a Proline, in just one part at the end of the resulting protein. Lyon believes this changes the structure of the protein, which makes it less effective than a normal protein, causing a myriad of effects for the babies. Because the affected gene is on the X-chromosome, it affects only males. The boys have heart rhythm abnormalities and craniofacial abnormalities, which accounts for their similar appearance. The boys are never able to sit up on their own, and none have learned to talk. They all have a characteristically aged appearance, earning them the family nickname of "little old men.\ This one mutation also inevitably causes tragedy: All of the sick boys have passed away before reaching one-and-a-half years of age. Lyon came to Utah in 2009; he began working at the University of Utah, in search of disorders with genetic components. It was six months before he heard about the Black family. Alan Rope, a medical geneticist who was another author on Lyon's paper, referred him to the Blacks. Lyon was intrigued by the Black family because of the developmental delays associated with Ogden Syndrome, and the fact it occurred in multiple generations. He knew it was the perfect case for the new software system he had come to Utah to use. Lyon thought this new technology could be perfect for the Black family. "This was the number one family I selected," Lyon explained, \"because it was a rare, lethal, highly penetrable mutation that was passed down from the grandmother to two of her sons. Then, at that time, from two of her daughters to two of their sons.\" A third grandson recently passed away from this syndrome — he was sick at the time that Lyon and his team were researching its genetic cause. VAAST, the Variant Annotation, Analysis and Selection Tool, is a disease-variant algorithm that uses probability to narrow down results. Designed by Mark Yandell and Martin Reese, it uses a background genome file of "normal" genes, or genes without any significant diseases or mutations. It then searches for anything on an entered genome that is new or more frequent than in the background genes. So, why did Lyon choose Utah to conduct his research? Because Utah is known for having large families who all live close together, making it ideal for genetic testing, he says. "Utah is pretty much unique, other than maybe Iceland, in terms of its geographic isolation," Lyon said. "It has extremely large Mormon pedigrees, where it's not uncommon to have large families of 6-8 kids. And... many people just don't leave." He arranged to visit the family in their Ogden home. "We thought that was breath of fresh air," the Blacks' grandmother said, remembering Lyon's willingness to travel to their home. After all the deaths the family had suffered, she was hesitant to go back to the hospital and relive the tragedies of the past. Visiting the family at home also was helpful for Lyon, who was able to collect DNA samples from almost everyone at one time. "There were 12 people there. In the 13 years I was in New York City, I never was in a room with a family that had more than four people in the room," he says. Lyon spent the next several months getting the DNA ready for the VAAST software. His team had to sequence all of the samples, which took about six months. He then had to do exon capture and next-generation sequencing, gathering about three million base pairs. He then culled the variants from that, which he finally entered into VAAST. Once the data were entered, VAAST spit out the result in only a matter of hours. But that still wasn't the final answer for Lyon. "There wasn't a eureka moment because I didn't believe it," Lyon recounted. "When they gave me the variant I said 'What if we missed something? ''\" He double-checked. He compared the mutation to the DNA of the deceased babies, and made sure the two healthy males in the family did not have the mutation. He used a team in Norway who built the mutated protein and confirmed it would not function normally. And he compared the mutation to 6,000 other sequences to see if there was a match. There was none, proving this a unique and rare mutation. As he was preparing to publish the results, another team researching a family living mainly in California contacted him. The new family had also lost three infant boys with similar characteristics. Lyon tested the new family and found they had the same rare mutation as the Black family. The existence of another family made this mutation a syndrome, and not something isolated to the Blacks. This also proved to Lyon that he had found the true cause of the infants' deaths. The news brought some solace to the Black family. "They feel like they've learned something," reflects Lyon. "They have some sense of closure, in the sense that they know that it's a mutation that causes this. They'll know who's a carrier and who's not a carrier. And they love the fact that there is a second family, that they are not alone." "What a relief," Black says of finding the cause. "It's so nice because now other grandchildren can be born into our family, and we can help other people." Although there is no cure for the disorder, a family can now find out who caries the mutation and can test babies while they are in the womb. Now, knowing the cause, both Black and Lyon want to help other people. Lyon is a principal investigator in the Center for Applied Genomics at The Children's Hospital in Philadelphia, and a research scientist at the Utah Foundation for Biomedical Research. He is working with VAAST to find the mutations responsible for more complex diseases like ADHD or autism. He also hopes to develop a drug to counter the effects of the mutated protein in Ogden Syndrome, although he realizes this could be decades out. He continues to work in Philadelphia and Utah, and is confident that genetic sequencing will be integral to the future of medicine. Black hopes to help other mothers in her small Ogden community who might have the same genetic mutation. She hopes that people will learn to recognize the characteristics of Ogden Syndrome and get DNA testing for it, so that infant deaths in their families do not have to be mysteries like they were for her for so many years. Despite now knowing the cause of the mutation, the Black family is still affected by it. Halena lost another grandchild to Ogden Syndrome on June 19, 2011, in the same month when Dr. Lyon's findings were published to the scientific community.